Last Christmas we were privileged to send over 38,000 shoebox gifts to children and families in Belarus, Bosnia, Ukraine and Romania! 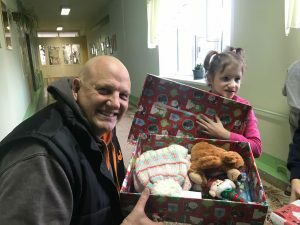 There are no words to describe the beauty, power and privilege of the Shoebox program for everyone involved in it from the volunteers who knit each hat to those who get the unique joy of handing each box out and seeing the 100 kilowatt smiles from the children. It’s simply an incredible program and one that humbles all of us at T4U everyday! Through inspiring generosity from many people across the UK we were able to send 38,000 Christmas gifts to children and families in Belarus, Bosnia, Ukraine and Romania. Our Founder, Dave Cooke, joined the distribution of the boxes in Belarus, giving them out to children in orphanages and those in state care. Porshkovo, meeting people like Elena, a young 22 yr old mother of 7 children, understandably finding it difficult to make ends meet! Our distribution team struggled to comprehend the harshness of the poverty endured by these people, barely surviving on so little. Volunteer teams also joined the boxes in Romania, helping the distribution in the regions of Cluj-Napoca, Salaj and Maramures. Though an EU country, many Romanians still experience desperate poverty such as Larissa, who’s only meal of the day was the bread and milk her school provided at break-time to a young mother who had lost her roof in a fire and would never be able to afford to replace it. Our teams encountered many stories of hardship and financial vulnerability and in the face of such adversity we could easily question what difference a Shoebox makes. And yes people need education, employment, food and shelter, but having seen it all (and working with partners that are tackling these things too), we can say you can’t put a price on the beauty of that moment, when poverty is forgotten and the everyday struggle has been interrupted by joy. Having started our shoebox appeal in 2013, sending just over 4,000 shoeboxes to Romania, we cannot begin to express our gratitude to all those who continue to believe in what we are doing and have helped us get to where we are today, sending almost 10x as more boxes! We are now excitedly looking forward to 2018!